Circus Roboticus, Or: This Actor Is A Serious Heavyweight A repurposed robot prototype named KUKA, originally designed by the auto industry, is the breakout star of Sans Objet, a performance piece making its debut in the U.S. this month. Randy Gener describes the rewards — and the challenges — involved in working with a nearly 3,000-pound diva. 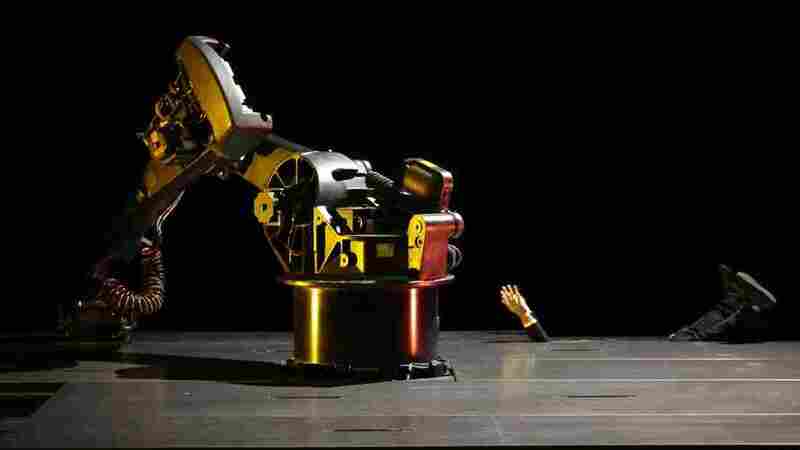 KUKA, an industrial robot developed in the '70s, is the unlikely star of a French nouveau-cirque piece premiering in the U.S. on Friday. Whenever the military rolls out some revolutionary new robot, folks are quick with the Skynet jokes. But in recent years, some robotic-evolution experiments suggest that robotic rebellion might end in applause rather than annihilation. 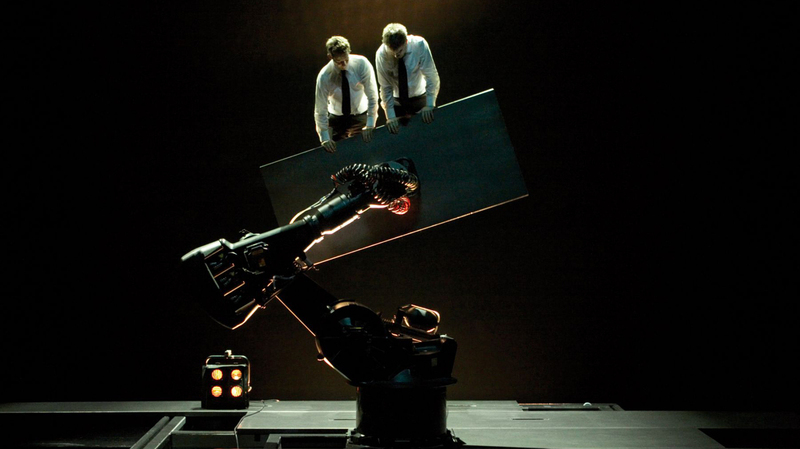 Take, for example, the robot KUKA — the hulking star of a French nouveau-cirque performance, Sans Objet, which premieres at the Brooklyn Academy of Music on Friday. It's no special effect; it's a real robot, developed by the automotive industry in the 1970s. "It is an elaborate robot, skillful, powerful and fast," says Tristan Baudoin, the light-and-sound technician responsible for operating KUKA and programming the Windows 95 software that runs it. "This robot is a mechanical arm articulated in six axes, which copy the shoulder-elbow-wrist movements of a human arm," he says. "He used to carry heavy pieces in car assembly lines." And KUKA isn't a prop or a piece of scenery. The robot is a major character in Sans Objet, a mysterious bulk who grows very tall, spreads himself wide and is strong enough to pick up people effortlessly and turn their bodies in the air, the way Hamlet would inspect a skull. He likes to throw his 2,866 pounds around. Because of his size, he requires his own dressing room. And he goes around with an entourage. The cast and creative team of Sans Objet learned the hard way that a 2,800-pound robot can be a bit of a diva: Because he's run by a computer program, he never forgets his blocking. "We need two forklifts of increased capacity to get it off the truck," says Dylan Nachand, production supervisor for the Brooklyn Academy of Music. "We need to be careful and meticulous in handling him." Sans Objet has toured Germany and Austria, so KUKA is "the first industrial robot globetrotter," Baudoin says. "During the creation, it often happened that we have to force him to climb up three steps," he says. "He is therefore also the first industrial robot that has mounted stairs." The latest creation of the Toulouse-based circus ensemble Compagnie 111, headed by Aurelien Bory, Sans Objet is a large-scale, visually poetic performance piece that also showcases the acrobatic talents of two human performers. "To work with a robot means basically to make a program," says Bory. "You have an idea, then you program it, and it takes hours. Then you can finally try your idea, notice that it is wrong, and turn to another idea that takes again hours of programming. The challenge required patience and pugnacity." Translated: KUKA was a diva during the 14 weeks of rehearsals. "First you must know that a robot is a fascinating mover, very precise and even elegant," Bory says. "What it can do, it does it perfectly. That's the difference with human beings. We are, fortunately, not perfect." Randy Gener, a New York-based editor and writer, is an ArtsFwd Blogging Fellow and the recipient of the George Jean Nathan Award for Dramatic Criticism.